The blaze at the detention facility in Carabobo state is the latest in a series of deadly incidents. 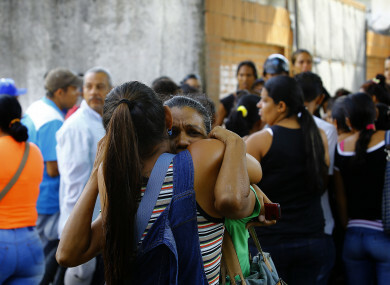 A FIRE ALLEGEDLY set during an attempted jailbreak from Venezuelan police holding cells killed 68 people yesterday, the country’s top prosecutor and an inmates’ rights group said. Nieto’s association estimated that the temporary detention centers were overfilled by five times their capacity. Two weeks ago, 58 detainees escaped holding cells on Margarita Island, a favored tourist spot, when a hole opened up in their facility’s wall. They were all soon recaptured. Email “68 people killed in Venezuelan jail fire”. Feedback on “68 people killed in Venezuelan jail fire”.